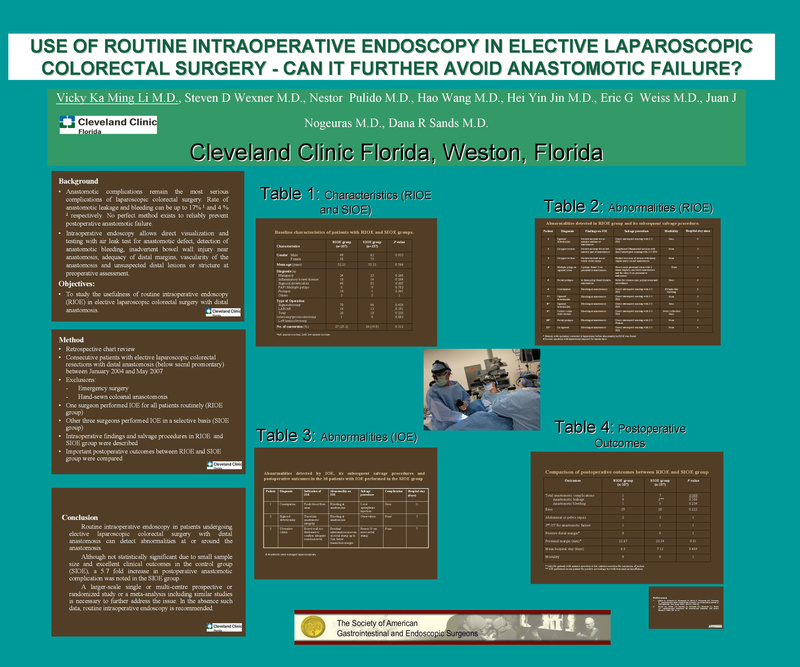 Use of Routine Intraoperative Endoscopy in Elective Laparoscopic Colorectal Surgery – Can It Further Avoid Anastomotic Failure? Background: Anastomotic leakage, bleeding and local recurrence remain serious complications of laparoscopic colorectal surgery. We aimed to study the usefulness of routine intraoperative endoscopy (RIOE) in elective laparoscopic colorectal surgery with distal anastomosis to predict postoperative anastomotic failure. Method: A retrospective review of 244 consecutive patients between January 2004 and May 2007 was performed. While one surgeon performed RIOE (n=107), the other three surgeons performed selective IOE (SIOE, 30/137 patients, 21.9%). All abnormalities in patients with RIOE were managed with a subsequent salvage procedure and their postoperative outcomes were described. Matched outcomes data were compared between patients with RIOE and SIOE. Results: In the RIOE group, abnormalities were detected in 11 patients (10.3%) (6 with staple-line bleeding, 3 with positive air-leak test and 2 with additional pathology identified). One patient was converted for staple-line haemostasis. One patient developed postoperative staple-line bleeding requiring re-operation while the other 10 patients recovered uneventfully. The mean hospital stay was 6 (range: 4-9) days. The overall rates of anastomotic leak and staple line bleeding in the RIOE group were 0% and 0.9%, respectively. Postoperative outcomes comparison between the RIOE and SIOE groups showed a tendency towards more anastomotic failure (0.9% vs 5.1%, p=0.069) in the latter group which, due to the small sample size, did not translate into significant differences in terms of staple line bleeding (0.9% vs 3.6%, p= 0.234) and anastomotic leak (0 % vs 1.5%, p=0.506). There were also no significant differences in other outcomes such as ileus, abdominal or pelvic sepsis, reoperation, positive distal margin, distance from distal margin, length of hospital stay or mortality. Conclusions: Although there were fewer postoperative anastomotic complications in the RIOE group, due to the small sample size this 5.7-fold increase in anastomotic failure did not translate into significantly better postoperative outcomes compared with those with SIOE. A larger-scale single or multi-centre prospective randomized study or a meta-analysis including similar studies is necessary to further address the issue.